Media and Contents: Soft cover, 80 pages plus Luftwaffe color camouflage guide. Advantages: A thoughtful approach to modeling that amounts to more than a “how-to” book. Disadvantages: Some references to unavailable products. Recommendation: Highly Recommended to all modelers, regardless of level of experience. Brett Green, the Editor of HyperScale, has written a very enjoyable book that can be appreciated by modelers at every level of ability; whether a relative newcomer or an “experten” suffering from Advanced Modeling Syndrome (AMS). Brett’s book is not the usual linear approach of how to build a specific aircraft: History of the aircraft, insert tab A into slot B, apply a little putty, sand and paint and decal this way. Brett also conclusively answers one of the most frequently asked questions on HyperScale, not what is Future called in my country, but rather, how is the 1/48 Fujimi Bf 110 C/D kit? The answer, based on Brett’s work, it builds into a great model of a Bf 110. After a brief discussion of the history and variants of the Bf 110, Brett builds the Fujimi kit straight from the box with magnificent results (OK, he does use Tamiya figures and Fast Frames). Then he goes on to give ideas as to how to present the model, in this case using Photoshop to present the aircraft in flight (What he titles this section, not even going to touch it!). Brett then proceeds to build the same model with all the embellishments at his disposal – True Details cockpit, Eduard photo-etched, Cutting Edge details, etc. The unfair part of this is that, as he does note, the True Details cockpit is no longer produced, as are not the Aeromaster decals for an all black aircraft of 5/NJG4. Brett repeats the process all over again, but in the second instance he uses the various Revell-Monogram G series models. Here we learn that a mere misplacement of the pitot tube can turn an early Bf 110 G into a late F! As was the case with the Fujimi kit, Brett succinctly describes the steps one can take to turn a mere model into something more, even at an out of the box level. Certainly, the skills called upon are not much more than those possessed by any modeler with a couple of models under his or her belt. Even though most of the models were photographed upon the ubiquitous Luftwaffe hardstand (Weren’t any Luftwaffe aircraft allowed to park on the grass? ), Brett concludes his book by showing how to make a unique display base, a compass swing platform, based on the Verlinden compass. Again, succinct instructions on construction, painting, weathering and use of figures. Some random notes I have, that did not fit into the text. I wish Brett had expanded his chart showing the basic differences among the actual Bf 110 variants; a little more detail on the differences between the G-2 and G-4 series would have been helpful. Then there is that very nice Luftwaffe camouflage color guide at the back. While the colors should not be relied upon as a definitive guide, it does give a fine sense of the relationship between and among the various patterns used. Making this color plate a little different is the inclusion of part of the Balkenkreuz, take a look and you’ll see what I mean. In conclusion, this book should be standard issue for every new modeler and regardless of your level of modeling experience, Brett’s book can be an invaluable or merely valuable resource. 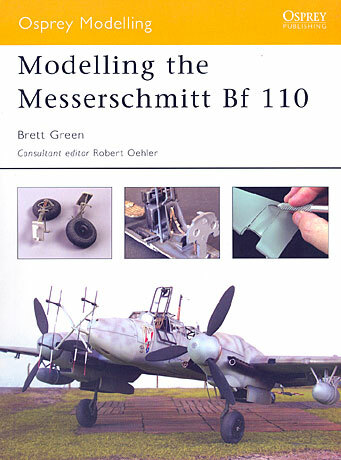 Follow this link to see an extract from Osprey's "Modelling the Messerschmitt Bf 110"